Almost 1,000 tickets have been snapped up for a major celebration featuring babies born during Hull’s year as City of Culture. Babies had their footprints taken to create a major piece of art for the “Born Into a City of Culture” project throughout 2017. Now, Hull University Teaching Hospitals NHS Trust is inviting families to the celebration on Wednesday, January 24, at the Guildhall. Head of midwifery Janet Cairns said: “We have sold almost 1,000 tickets in the first few days to new parents keen to take part in the event. “This will be a fantastic celebration to mark the end of a really successful project and we hope as many of the families as possible will be able to join us. All through 2017, babies born in the city had impressions of their feet taken by midwives and midwifery assistants, with the footprints added to specially designed wall panels displayed in the foyer of Hull Women and Children’s Hospital. 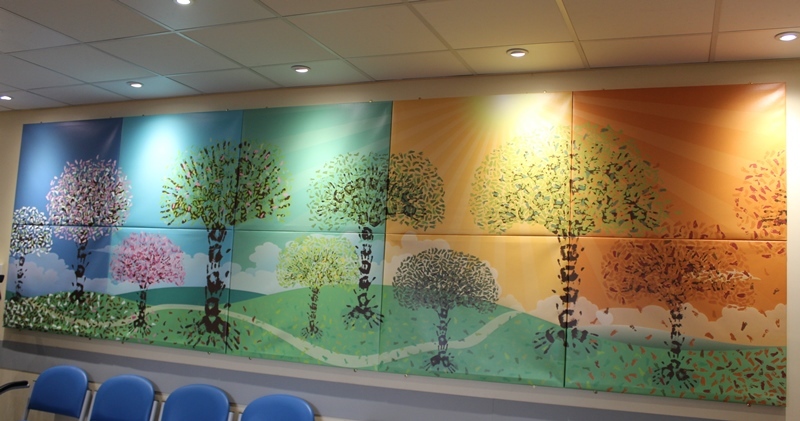 New panels featuring the hands of midwives as tree trunks and branches and the footprints of the babies as leaves were added to the artwork throughout the year, with the final panel due to be added before the end of January. When will the celebration take place? The “Born Into A City of Culture” celebration event will take place on Wednesday, January 24, in the Banquet Hall and Reception Room at the Guildhall between 9am and 3pm. My baby’s footprint was taken. How can I get involved? People will be invited to attend one-hour slots, with 400 timed tickets offered for each hour. Busiest sessions so far are from 11am to noon, 1pm to 2pm and 2pm to 3pm so book outside those times if possible to ensure a place. How can I get a ticket and how much does it cost? Families will be offered the opportunity to buy up to four tickets, costing £1 each with a 50p booking fee, to ensure as many as possible can attend the event. All proceeds raised from the celebration will go towards improving patient experience in the trust’s maternity service. What’s happening at the event? Families will be able to enjoy a montage of photographs taken by the trust throughout the year of the project. There will also be a group photograph taken of the families on the half hour, every hour. Parents will get the opportunity to meet other families involved in the project and be reunited with the midwives who delivered the City of Culture babies. There will be soft play and sensory toys available to keep the babies entertained along with “selfie” frames so families can collect their own memories of the day. Specially designed biscuits designed in the shape of footprints will be available from Cookie Doodle Doo along with other memorabilia to celebrate the event. Great British Bake Off winner Nancy Birtwhistle will also be making a special cake for the occasion. Parents will also be able to visit a range of health information stalls to help with the next stages of their child’s development and get more information if they are planning their next baby. I didn’t get a postcard of the month my baby was born. Can I still get one? You’ll be able to buy postcards of each two-month section for £1 or £6 for all 12 panels featured in the art work. Postcards of the final panel, featuring babies born in November and December alongside those babies who had their prints taken in December from our recall event, will also be on sale for £1. Prints of the full artwork will be on sale for £10 or two for £15. A limited number of canvases of the artwork in different sizes will be available and details will be provided on the day about how those can be ordered. Please remember that only cash will be accepted, with no facilities for credit or debit cards on the day. City of Culture director Martin Greene will be at the event alongside senior figures from the hospital trust including medical director Colin Vize and non-executive director Stuart Hall. Can I bring my pram? A pram park will be set up in the Guildhall but, with a limited number of lifts in the building, parents are being advised to bring babies in car seats or carry them in slings if possible. Will I be able to get something to eat and drink? Light refreshments and snacks will be available to buy. Breast-feeding and feeding areas will be available along with changing facilities. It’s a “cash only” day. Credit and debit card facilities won’t be available.